On Thursday, June 1st, Cavalier ICE put in a clinical performance against Regina Royals. Royals electing to bat after winning the toss could only muster a meager 121 runs in their allotted 20 overs. Dhaval Patel derailed Royals' innings snapping 4 wickets in 4 overs. The below par total was never going to test ICE's batsman. Viru Chauhan got the chase under way after a wicket in the first over with a belligerent 36 of 14 balls. Harshal Trivedi took charge of the chase with a well compiled 39 runs, along with veteran TJ Singh who made a calm 26 as ICE cantered to victory in only 13.5 overs! Two days later on Saturday, June 3rd, ICE took on last year's T20 finalists United in another one-sided contest. The batting juggernaut continued its dominance taking the United bowlers apart posting 202 runs - their 2nd T20 score of 200 or more this season. Dhaval Patel made amends for a poor outing with the bat against Royals to make an aggressive half-century at the top of the order. Chauhan, Darshak Patel and Trivedi then chipped in with attractive 30's to carry ICE to a strong 1st innings total. United's chase never took off as Chauhan followed his batting performance with a good outing with the bowl; nipping out 3 of United's top 4 batsmen and finishing his spell with 4 wickets. Cavalier left-hand spinner, Aman Saini and seamer, Chandan Parmar, chipped in with 2 wickets apiece as United were routed for 105 giving ICE a win by a whopping 97 runs. On Sunday, June 4th, ICE took on Royals again. This time the two teams met in a 50 over Division 1 match at Douglas Park. Royals won the toss and decided to bat. A steady start by Royals batsmen eventually ran into Saini's guile. He snapped up 6 wickets in an uninterrupted spell, never allowing the Royals innings to get going. At the end of the first innings, Royals were reduced to 120/8. Only a rearguard from Hardik Patel and Nirav Patel with a 97 runs 9th wicket partnership got Royals to a total they could hope to defend. Royals bowled well up front and managed to get both Ice openers Chauhan and Rushi Patel out for low double digits. Radhey Shah, promoted at #4, then took control of the situation making a polished 62 in the company of brother Vraj, and then TJ Singh, rattling of the deficit quickly leaving only 59 runs to chase upon his dismissal and dashing any hopes of Royals causing an upset. Ice's middle order ensured there were no further hiccups cleaning up the chase in the 40th over. 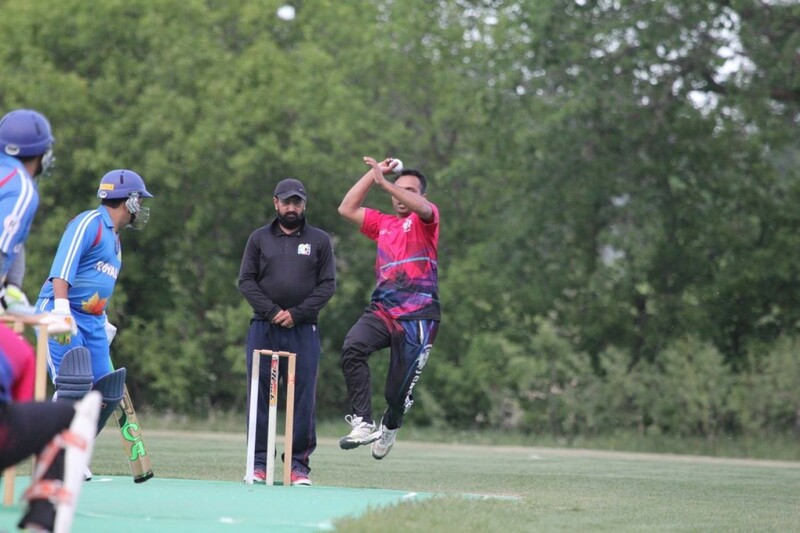 Following the Ice v Royals game on Sunday, Cavaliers FIRE took on the undefeated Regina Super Kings (RSK) in a pool A T20 match. After winning the toss RSK decided to bat first and went after the Fire bowlers from the get go. Fire's seamers Joe van Heerden and Santhosh Veerabhadrappa bowled well upfront picking up wickets regularly, however they were not able to control the run rate. 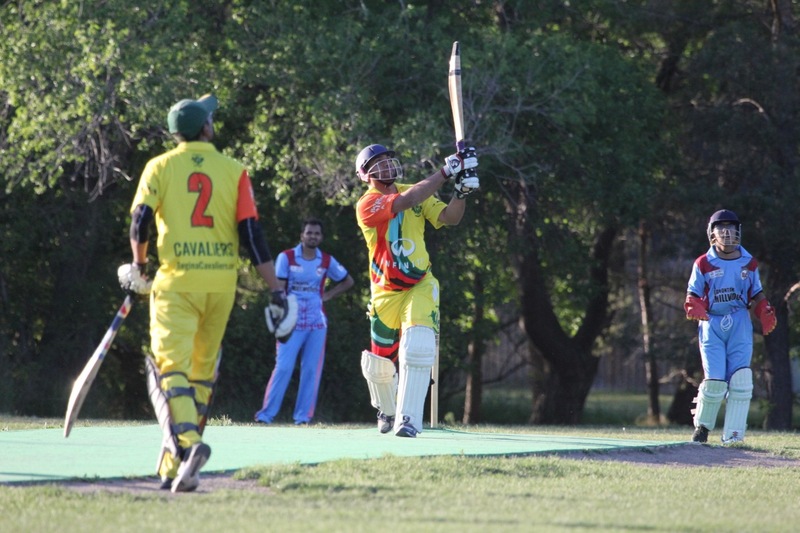 RSK's skipper Vijaypreet Singh top scored with 78 runs, as RSK set Fire a target of 206 to win. Fire's captain Richard was the most successful bowler grabbing 3 wickets. Unfortunately, Fire had a nightmare start to their chase, losing 3 wickets inside 2 overs. Chasing a stiff total, Fire continued to lose wickets in an attempt to keep up with the mounting run-rate and were reduced to 77/7 at the halfway mark. Aman Gill gave Fire something to cheer about with an unbeaten 46 of 20 balls but received no support at the other end and ran out of partners in the 16th over. RSK won by 60 runs and remains undefeated and at the top of the pool A leaderboard.